Two hundred years ago today…there on the vast plains of Russia…about three days’ march from Moscow, the Battle of Borodino was fought. 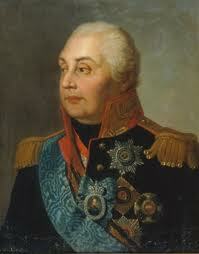 Fought between the pan-European troops that made up Napoleon’s Grande Armee and the Russians under the leadership of the one-eyed, aging Prince Mikhail Kutuzov. For weeks, under the glaring, baking sun of the Russian summer, the Grande Armee had been advancing deeper and deeper into the heart of Russia. The troops were exhausted, debilitated by dysentery and hunger. Yet despite their manifold hardships, Napoleon pressed on–he was determined to bring the Russian army to battle. He needed the Russian army to stand and face him, so that he could deliver his favourite thing in all the world–an all-out battle of his massed troops and obliterating artillery which would shatter the enemy in a day-long blitz of annihilation. 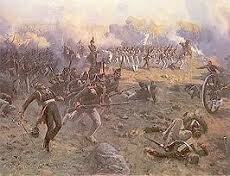 Yet by early September, the Russians had resolved to stand and fight, and began taking up positions near the village of Borodino. A bitter wind had been whipping across the plains from the north, whistling through the trees, chilling the troops of both armies that they did little but shiver. The French had no firewood and hence no fires near which to warm themselves. Neither had they had any rations for two or three days. By the 6th September, the Russians had taken up their positions on the rising ground and in redoubts and the early stages of battle seemed to be commencing, with cannon and artillery fire. But this ceased as darkness fell. Before daybreak on the 7th, [the 26th August, if you’re using the Russian calendar] the drums, beating to war, were heard and the officers called to arms. 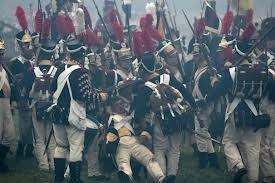 At six o’clock, the French guns opened up, signalling the beginning of the day of battle. The Russian guns answered back. What was to follow was the greatest massacre in European history, with casualty numbers which would not be surpassed until the first day’s fighting of the Somme. The fighting was ferocious, beyond savage. Everywhere, the bodies piled up six and eight deep high, the wounded drowning in the blood of their comrades, buried under a tangles of lost limbs, while the horses and men of the French cavalry were forced to stand under the bombardment of the heavy guns and the musket fire that fell upon them like hailstones. “There are no words to describe the bitter despair with which our soldiers threw themselves into the fray…It was a fight between ferocious tigers, not men, and once both sides had determined to win or die where they stood, they did not stop fighting when their muskets broke, but carried on, using butts and swords in terrible hand-to-and combat, and the killing went on…” wrote a Russian officer. Of the over 200,000 troops which were ranged against each other, by the end of the day, over a third were either killed or wounded. 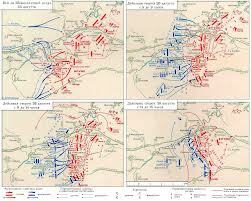 French losses are recorded at somewhere between 28,000 and 35,000 casualties. Russian sources vary too–some say they lost no more than 38,500. Others insist the number is more like 58,000. Again, due to varying sources, we know that the French artillery fired off between 60,000 and 90,000 rounds during the course of the day. 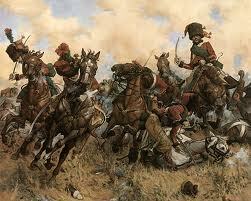 Less well-known is the destruction of the French cavalry. 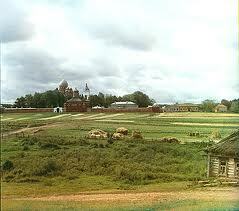 In the spring of 1813, Russian authorities would find and bury the corpses of some 35,478 horses on that battlefield. 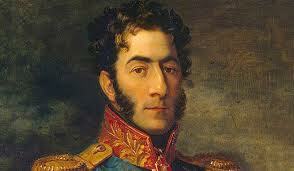 The Russians, led by General Kutuzov, also claimed it as a victory. And in at least one way they were very right. The French were now thousands of miles from their supply lines, from home, their forces so weakened by disease, hunger, and exhaustion–many of them had marched into battle barefoot–that they had no hope of recovery, even if they survived the battle. Those who were wounded begged and screamed to be put out of their misery. There was no hope of a field hospital for them. Still, when I look at those numbers of casualties, I cannot but mourn. So many lives lost to serve one man’s insatiable lust for power. Alle Seelen ruhn in Frieden. This entry was posted in History, Napoleon and tagged 1812, Invasion of Russia, Military history, Napoleon, Napoleonic history. Very very graphic description. And it happened all over again 150 odd years later, with the Germans at Stalingrad. You are right to remind us of this. These catastrophes are on such a shocking scale, it is hard to believe even when you read about them. What a species we are! Napoleon was a man drunk on power and just an earlier version of Hilter. So many people died, and suffered terribly. Man has dominated man to his injury for sure. I think–and this may be heresy to say so–that he was actually worse than Hitler. Because what I don’t know, what historians can only guess at, is the magnitude of the atrocities against civilians which his troops committed while he deliberately looked the other way/or encouraged as a means of inducing terror and fear in conquered populaces. His state-sponsored pillage of art treasures from every country he visited makes Hitler’s similar attempt look like child’s play. And his troops desecrated and sacked churches from one end of Europe to the other–as well as what they did in individual homes. What is a bit more worrying is that very few universities across the UK are covering this period of history–most are excluding it. And how can that kind of gross ignorance of a period which changed the world be good?